It was only a week ago when we hailed NY District Court Judge Rakoff for stopping the Obama Administration from 'selling immunity' to banks. In a settlement that only needed the signature of a federal judge to finalize a $285 million pay-off to the SEC, the deal would have forgiven and forgot all allegations that Citigroup committed mortgage securities fraud, profiting off it's own deceived investors. Rakoff refused to sign. Now another official has refused to allow Obama to sell immunity to Wall Street for loads of cash. This week Massachussetts Attorney General Martha Coakley announced a state wide lawsuit against Bank of America, Wells Fargo, JPMorgan Chase, Citigroup. and GMAC/Ally for "unlawful and illegal foreclosures in MA", seeking damages for cutting corners and short-changing the little guy. Coakley's action comes after a tense months-long standoff between the Obama Administration and a tiny faction of state Attorneys General who pulled out of a 50-state panel after learning Obama's SEC and HUD were willing to grant immunity for tens of thousands of instances of robosigning and fraud in exchange for a pennies-on-the-dollar pay-off which some called "the next bank bailout"
The first Attorney General to stand up and shine a light on this was New York Attorney General Eric Schneiderman. In Obama to State AGs: Don't Do Your Job we asked everyday people to contact Schneiderman's office to support him. Schneiderman was quickly kicked out of the 50-state panel by Iowa AG Tom Miller, who saw the idea of "selling immunity" differently as a recipient of campaign donations from major banks. Gradually, Schneiderman would receive praise from AIG, FDIC, various ripped-off banks, insurers and fund managers, plus a letter signed by all 21 Democratic Representatives from New York. Rolling Stone's Matt Taibbi sharply pointed out at the time, that Obama would likely want to hurry a settlement through because it was rapidly nearing campaign contribution season when he'd expect the money to start flowing from these banks. Schneiderman soon saw help from Attorneys General from Delaware, Nevada, Kentucky, Minnesota, Massachusetts and California Attorney General Kamala Harris who not only pulled out of the 50-state panel, but subpoenaed documents from Fannie Mae and Freddie Mac, Citi, and Bank of America on Oct. 18, 2011 in relation to securitization of mortgages in their Countrywide division. This was of course, one day after the fateful launch of the global #OccupyWallStreet movement, begun in NYC and spread to include sustained street protests in over 1,000 cities within weeks. Massachussetts Attorney General Martha Coakley was diligently preparing her own lawsuit then, we now surmise. 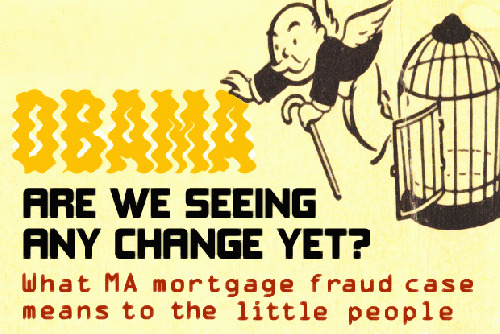 On the same day Coakley revealed the charges, the Obama Administration was up for a bit of window dressing, announcing that the Treasury, TARP investigators and the CFPB had formed a task force to go after mortgage fraudsters exploiting the HAMP program, considered a "penny-ante" effort compared to the widespread impact the robosigning, securitization and origination fraud has in real terms. In reaction to Coakley's lawsuit, GMAC has stopped purchasing mortgages in Masachussetts, saying Coakley's lawsuit makes it too costly to do business in the state. But because GMAC's parent, Ally received a $17 billion taxpayer bailout during the 2008 financial crisis, and is now over 70% owned by the taxpayer, Coakley has sent an extra letter to House and Senate finance committees asking for help in probes of Ally. Ally says they haven't foreclosed on anyone that wasn't significantly behind on payments, but it seems they aren't understanding the specifics of the suit (see video). The banks all reacted by suggesting Coakley was hurting consumers instead of the other way around. JPMorgan said Coakley should have kept to the 50-state negotiations, which could "bring immediate relief" to borrowers rather than "years of contested legal proceedings." In fact the highest settlement figure floated so far has been $25 billion proposed to address over $170 billion in consumer losses. Bank of America said "collaborative resolution rather than continued litigation will most quickly heal the housing market and help drive economic recovery". Wells Fargo said this "will do little to help Massachusetts homeowners or the recovery of the housing economy in the Commonwealth." Experts say discovery in this suit brings new transparency to burning questions over why federal regulators haven't brought a single prosecution in the mortgage crisis, including the reluctance of the Obama Administration to use the Sarbanes-Oxley Act to prosecute CEOs for intentionally misleading investors. In "Prosecuting Wall Street", Steve Kroft of 60 Minutes went hard at Lanny Breuer, head of the criminal division at Obama's Department of Justice, asking where the justice be at. Breuer said that he understands the frustration, but these things take time, and not to worry because his DOJ is fully independent and will unleash a "real response" sometime in the future. But this rhetoric is undercut sharply by a senior investigator for Obama's FCIC, the Financial Crisis Inquiry Commission. Tom Borgers is a seasoned fraud investigator who saw hundreds of bank executives prosecuted and jailed after the Savings & Loans scandal. Borgers directly prepared criminal referrals then, sorting out millions in recovery and damages claims. This time, Borgers said the FCIC found no shortage of prosecutable crimes, they saw evidence of trillions of dollars of fraud and gross negligence as well as crimes committed by "mortgage originators, underwriters, banks...across the board." Borgers said the reason we haven not seen any prosecutions this time is.... "lack of support". Coakley's 60 page complaint includes charges against falsified documentation or notarizatizions, otherwise known as robosigning. Next is the charge that the banks had no legal right to begin foreclosures because they did not actually hold the mortgage. For this, we can thank that slice-and-dice securitization process we've heard so much about, the one that not only made "ownership" of a given mortgage difficult to track, it sometimes converted the mortgage instrument itself into stock. For a bank to foreclose, they are required to gather together all co-owners to have them all sign over an assignment of mortgage into one name for the foreclosure. This was upheld in MA's Supreme Judicial Court "Ibanez" ruling. Another complaint was corruption of Massachusetts' land recording system through the use of MERS, a private electronic registry system. According to Coakley, the creation and use of MERS was adopted by the defendants primarily to avoid registration and recording requirements, avoid recording and registration fees, and to facilitate sales of mortgage loans by circumventing required public land use transparency. Another complaint involves banks failing to uphold promises to homeowners in search of modifications. It was also this week in Massachussetts when Elizabeth Warren took a lead in polls against Scott Brown in the race for US Senate. Many have no idea how much outside money will be spent against Warren, with millions pouring in from The US Chamber of Commerce, Karl Rove's Crossroads GPS, Wall Street, and K Street. This report lists many insurance industry, media, lobbyist and investment house billionaires Brown is travelling to meet with. With a reported $10.5 million in Brown's coffers compared to $3 million for Warren, it seems she'll be far outmatched in buying radio and TV ads, but with limitless outside spending now allowed, it could get downright insane. It's clear this race will be about whether we want to continue to have money influencing our politics. But seeing Coakley stand against the banks and seeing Warren's numbers surpass Brown's this week also reminds us there are some things money cannot buy.